I vividly remember my first few weeks of cutting out sugar from my life because it felt a whole lot like what I always imagined going through drug or alcohol detox feels like. I would be sitting at my desk trying to work but obsessing about the piece of chocolate cake I knew war in the fridge. In fact I remember one night, really late at night because I couldn’t sleep, quietly grabbing my car keys and sneaking out of the house to go up to the grocery store and eating a whole pint of Ben & Jerry’s before I could go to bed. Why was I sneaking? Because I didn’t want to disappoint my wife, who had already lost a substantial amount of weight eating low carb. Other common complaints are feelings of fatigue, mood swings, cramps, and a general sense of restlessness or “blah” that is sometimes hard to shake. So what is happening and how do we combat these issues to break through to the other side where this way of eating makes us feel great? Let’s take them one by one. This is the one that really hit me like a truck when I first started so it’s the one I’m going to talk about first. What is happening here is you are an addict who wants their drug! I know, I would have bet you a million dollars before this all started that I wasn’t addicted and could easily walk away at any time. Turns out sugar is ridiculously addictive and you can’t just walk away like it’s nothing after eating it in massive amounts for 40 years. It is perfectly natural to want to eat it in massive amounts after cutting it out of your life for a few days or weeks. There are 2 important things you can do to head some of these issues off before you start. The first is to have a pantry clean out day before you start and throw away all your foods with sugar and grains that are in the house. Please take my word for this, if there are snacks and sweets anywhere near you when you are feeling this desire to binge, you will eat it. These desires are always strongest at night when you are just trying to relax from the day and you won’t have the willpower after working all day to say no. You might think it is a waste of food to throw stuff away but it really isn’t. Your health is worth more than a few dollars worth of groceries. Of course if you want to donate it, donate it but don’t use that as an excuse to push back the day you will start. The second thing you can do is to have some kind of accountability, whether that be a friend or family member or if you join an accountability group like my 28 Day Challenge group. You need someone you can talk to when you are feeling like cheating and someone you don’t want to let down. The best thing to do is to just stick with it. If you can imagine a line graph showing the energy your body is burning for fuel with sugar at the top and fat at the bottom, the sugar is falling but the fat isn’t rising yet because it takes a little longer. There is a point where sugar is low but your body still isn’t really utilizing fat for fuel efficiently yet. If you are feeling fatigued, you are in that valley and just need to wait until your body get’s used to this new way of living. You should also up the amount of salt you are eating and you could possibly take exogenous ketones. I have never taken them because they weren’t available when I first started this journey but they give some people the boost of energy they need to get them to the point where they are making their own ketones. Also, if you are a T2D and taking medicines that affect your blood sugar levels, test you blood sugar levels often to make sure you are not hypoglycemic. Are you feeling cranky? Difficult to get along with? Snapping at family or co-workers? Congrats! You are detoxing! It is not a fun process for some people and they don’t always react well to this transitional time. Stay hydrated, up your salt and bear down. It might get worse before it gets better but it will absolutely get better. Over time your blood sugar will stabilize and so will your moods but in the short term, learn to count to ten before speaking in anger and do some deep breathing when you are annoyed. Sometimes you get cramps in your larger muscles. I would sometimes get them in my legs but I know people who got them in their arms or back. This is almost exclusively an electrolyte issue. 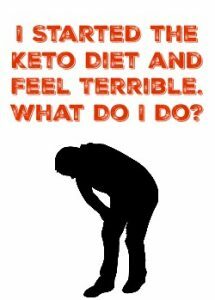 You lose a lot of water when starting the ketogenic diet and when it leaves, it takes sodium, potassium, magnesium and zinc with it so you will need to replace them. The best way to do that is to start salting your food with a non-processed salt like Redmond’s Real Salt and don’t be stingy with it. Salt your food to taste. You can also take electrolyte supplements but usually the salt is enough to fix any issues. Be sure you are also drinking a lot of water. Sometimes it feels like something is missing. You are so used to having a dessert after dinner or a mid-afternoon snack that when you stop eating those things, you feel a “hole” or a sense of loss. It can feel oddly like a low-grade mourning which is a weird way to describe it but it’s true. You feel like you should be eating but you don’t want another piece of steak or a pork chop so you aren’t sure what to do. Just eat until satiated, don’t snack just because you are bored and eventually your body will get used to the new reality. Soon you won’t feel weird just because you aren’t eating, I promise! If you didn’t notice, the solution to a lot of these issues comes down to the same few things over and over. Eat until full, don’t eat when not hungry, drink water, eat plenty of salt, and push through to where your body is fat-adapted. 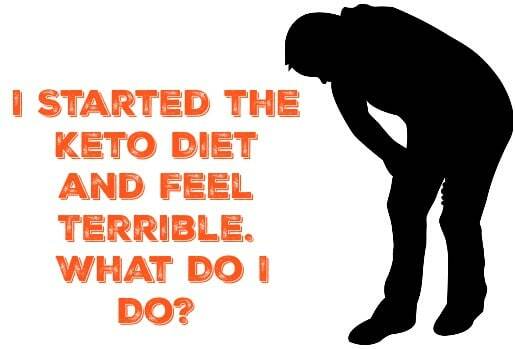 Once you are running on ketones, most or all of this goes away and you feel great.